The Clever Acoustics ZM8 is a 3U, rack-mountable, eight-zone, mixer with optional remote control wall panels that can be connected via CAT5 cable, designed as an expandable solution to suit a wide variety of installations from small to large, including offices, retail environments, airports, sports and conferencing suites. The eight-zone ZM8 mixer allows the input of up to eight signal sources as well as two dedicated paging microphones. The back panel houses four line inputs on stereo RCA (phono) sockets that have individual gain controls situated next to them. Channels five to eight can be accessed via balanced terminal blocks and can be set to line/mic level or +48V phantom power. An additional 600 ohm microphone input on XLR has dedicated gain, HF and LF controls, and can be prioritised on any given zone by using a dedicated 'MIC 1' priority button on the front panel. When priority is not selected, the signal from microphone one is mixed with other line inputs on that zone channel. Two optional paging consoles can be connected simultaneously to the RJ45 input ports, with each input having equal priority and operating on first come first serve basis. By linking another three ZM8 consoles via dedicated DB37 connectors, the user can have the functionality to provide audio to up to 32 zones. 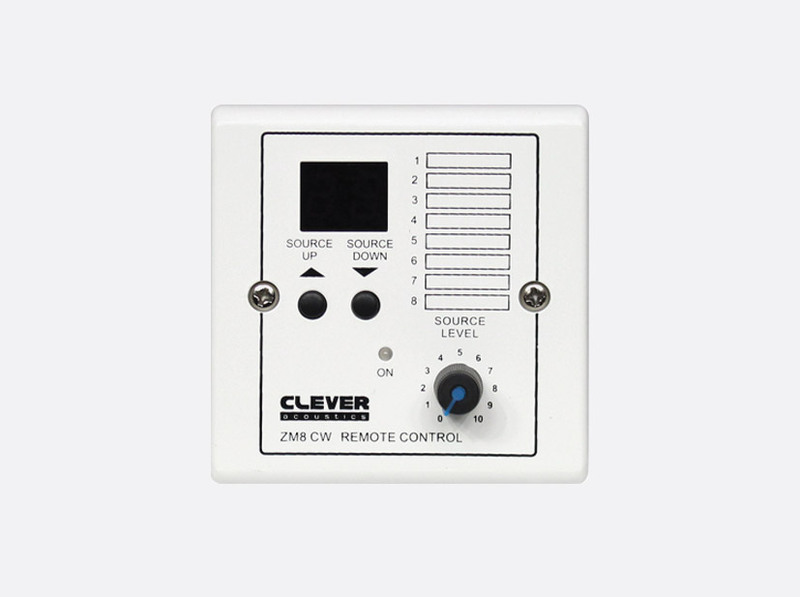 An eight-zone, voice alarm, contact closure can be used to active internal tone alarm, or an optional external voice alarm message may be broadcast to all 8 zones of the system via EMC and ground. Fire alarm, alert, EVAC, and EMC all have equal priority. Frequency response: 80Hz to 18kHz, microphone; 20Hz to 20kHz, line. Signal to noise ratio: Better than 65dB, microphone; better than 85dB, line. THD: Better than 0.07%. Communication speed: 4800bps. Communication port: RJ45. Communication protocol: RS485. Power source: 240V/ AC 50Hz, or 24V DC. Dimensions: 132 x 484 x 304mm (h x w x d). Weight: 10.3kg. The ZM8 BW is a dedicated wall plate for the ZM8 zone mixer. Once connected to the ZM8 via RJ45 terminated CAT5 cable, it offers balanced 600ohm XLR input with +12V phantom power and stereo 10Kohm RCA line inputs. A two digit LED indicator confirms the selected zone, and rotary control gives the user control over the source level received. Serial communication speed: 4800bps. Communication port: RJ45. Communication protocol: RS485. Maximum communication distance: 1km. Power consumption: 5W. Power supply: 24V DC, from ZM8. Dimensions: 86 x 146 x 48mm (h x w x d). Weight: 150g. 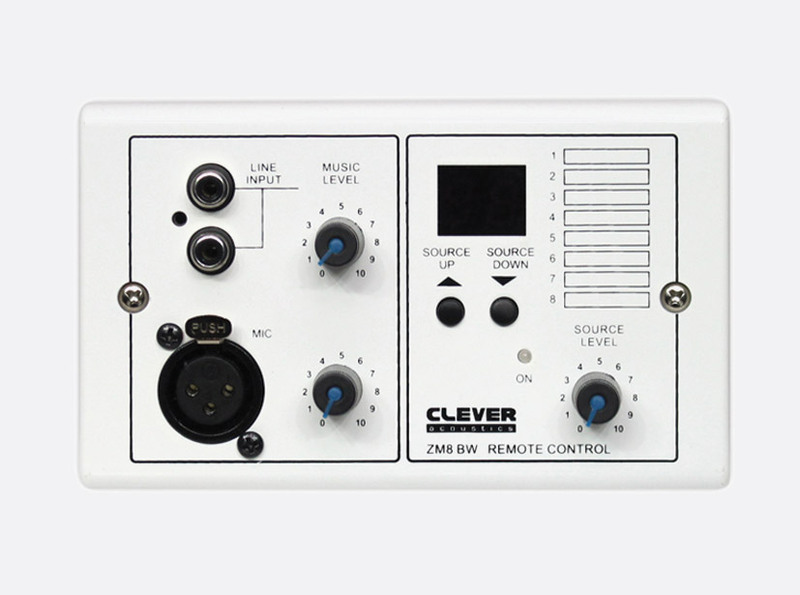 ZM8 CW wall plate gives the user remote selection of zone output for the associated space. Once connected to the ZM8 via RJ45 terminated CAT5 cable the ZM8 CW works from 24V DC to power the two digit LED indicator to confirm the selected zone. A rotary control gives the user control over the source level received. Serial communication speed: 4800bps. Communication port: RJ45. Communication protocol: RS485. Maximum communication distance: 1km. Power consumption: 5W. Power supply: 24V DC, from ZM8. Dimensions: 86 x 86 x 48mm (h x w x d). Weight: 70g. The ZM8 DW wall plate add the functionality of two remote microphone inputs via RJ45 terminated CAT5 cable. 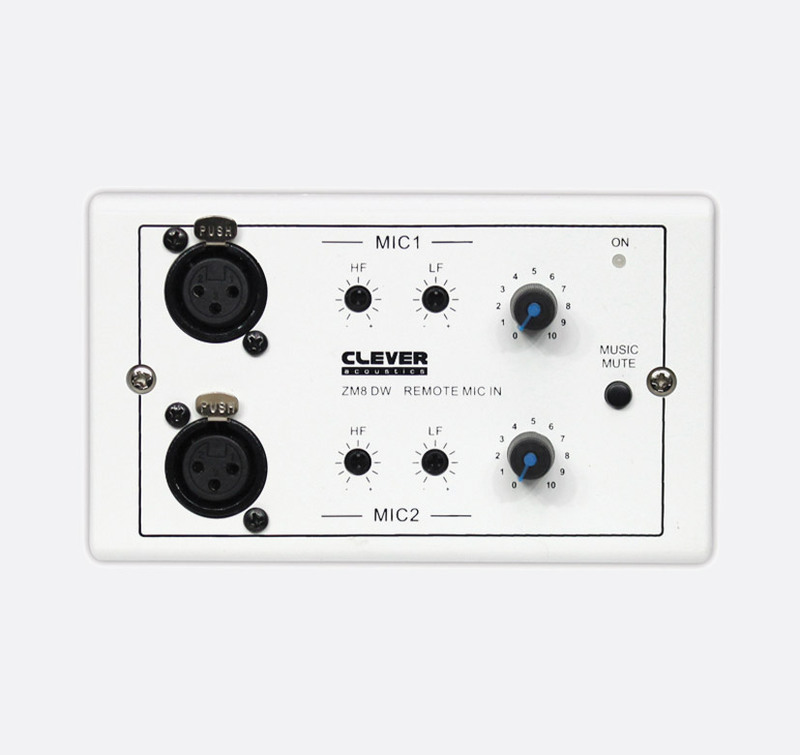 Each of the two balanced microphone inputs has a dedicated volume control, and both HF and LF adjustment controls. A 'Music Mute' button allows the user to remotely switch the music on/off.